Adding a Burden: Fundraising Friday: Pancakes! Our homestudy will be wrapping up in the next few weeks and that means it's time for John and I to start the next leg of our adoption journey: applying to the Russia program at our agency and starting the paperwork for our little guy's visa. Right now it takes about 50 days to get that visa (that does not mean we're bringing him home in 50 days). We want to have all the paperwork ready to mail as soon as we get our home study approved by our placing agency. This is very exciting! It is also very expensive! Which means we are swallowing hard and sweating a little bit as we think about the $15,000 we need to reach our goal. We have three new fundraisers planned for this month, so let me just apologize in advance for filling your news feeds with fundraising announcements, event invitations, donation requests and the like. I have mixed feelings about my posts lately; on one hand, I know I'm probably getting a little (a lot) repetitive and a smidgen boring with all my fundraising posts. Right now that's what we're spending most of our time and energy. On the other hand, I don't feel bad at all because I have this Mama Bear thing going on where I'm basically going to do anything to get to my cub. Three trips to Russia? Yes I will. Tear down a wall with my bear hands? In a heartbeat. Get a little monotonous with my fundraising posts? A touch annoying on Facebook? I'm okay with that. Once you see his face I think you'll agree- he's worth it. 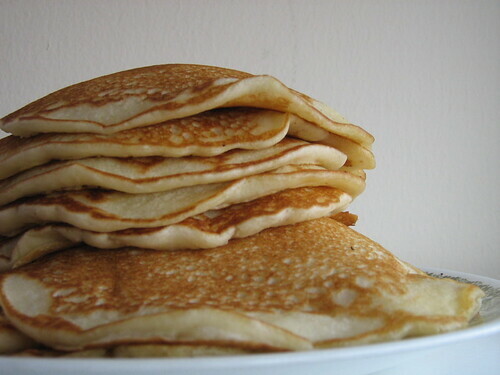 You are cordially invited to a Russian Pancake Breakfast, held at our church, on Saturday March 3. That's one month from today! As I have recently discovered, Russians love their pancakes and have a number of varieties. John and I will be trying out different recipes in the next few weeks in order to decide which kind to serve. Our choice will be based on taste and ease of making in mass quantities (based heavily on flipability (read: blini are unlikely)). If you have a Russian pancake recipe send it our way! And finally, we have our T-shirt designs, we've met with the printer and we are weeks away from having them in hand! I cannot wait to share them! Thanks Kaitlin!! We actually are indeed planning on having a gluten and dairy free option. I was going to use a mix recommended by anther gluten-free friend, but I am intrigued and will look at this one too! Thanks so much!